* Van Morrison on stage at the Eisteddfod last night. 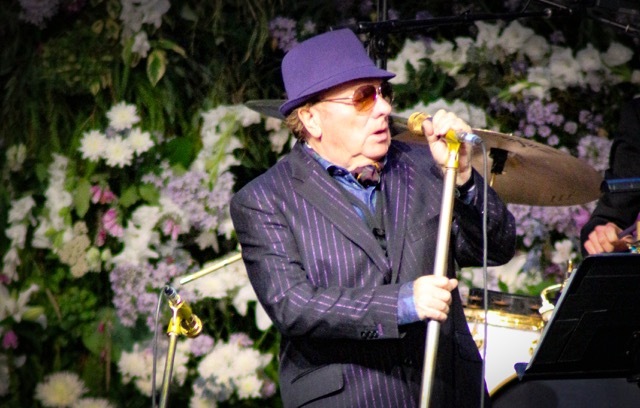 One of the most prolific recording artists and live performers in music history, Sir Van Morrison, took to the iconic Royal International Pavilion stage last night, captivating the crowd with a selection of Irish folk, jazz, blues and country music. Both songs were released from the album of the same name 50 years ago in 1968, yet still resonate perfectly today and brought the audience to their feet. Joined by his eight-piece band, including his musical director Paul Moran, Morrison barely drew breath for the following 90 minutes. This was his first appearance at the International Eisteddfod and he enchanted the audience with his largely improvised set, featuring favourites including ‘Baby Please Don’t Go’, ‘Days Like This’ and ‘Have I Told You Lately’. Morrison brought the show to a close and the audience to their feet with an exhilarating rendition of cult classic ‘Brown Eyed Girl’. This weekend included a performance-packed family funday on Saturday, celebrating those community groups that strive to create a sense of togetherness though music and dance on its outside stages. Sunday is Llanfest 2018, the festival’s finale party, with outdoor stages hosting live bands throughout the afternoon and multi-platinum English indie pop-legends, Kaiser Chiefs headlining on the main stage in the evening.